Tucker Unit is located in Jefferson County Arkansas. The facility houses minimum to medium custody level inmates. 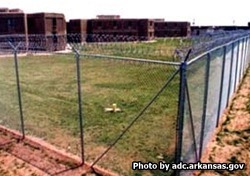 Tucker unit can hold approximately 910 inmates at any given time and employs over 200 staff. Inmates incarcerated in Tucker Unit have access to a variety of programs. The education programs allow inmates to earn their GED and basic adult education. Inmates can also go through the substance abuse treatment program to get help with various addiction issues. They offer a pre-release program to help inmates prepare for the day they walk out free, and have a habilitation program. The canine unit within Tucker allows inmates to work with dogs, while other programs include a variety of vocational training including agricultural and industrial opportunities. Visiting is held on Saturdays and Sundays from 11:30am-3:30pm. Visitors often start showing up around 10:30am-11am and wait to enter the facility. Because the inmates use a rotating/alternating schedule you will need to contact the inmate to see which day and time they are allowed to have visitors.